The Office of Freight Mobility is responsible for advancing policies and programs that mitigate the adverse impacts of trucks on infrastructure and communities, while also improving truck delivery efficiency with an overall mission of supporting the City’s economic competitiveness. The Office of Freight Mobility can be reached through our hotline number at 212-839-6670. Trucks and commercial vehicles are essential to New York City, providing goods and services to millions of New Yorkers every day. The City's diverse mixture of land uses, dense urban environment and vast transportation infrastructure require a distinct set of rules and regulations to govern the operation of trucks and commercial vehicles. In order for this system to function efficiently, it is important that drivers observe these rules and regulations. The information provided on these web pages is for educational purposes only. Please refer to the official New York City Traffic Rules and Regulations for the most current rules governing trucks and commercial vehicles. 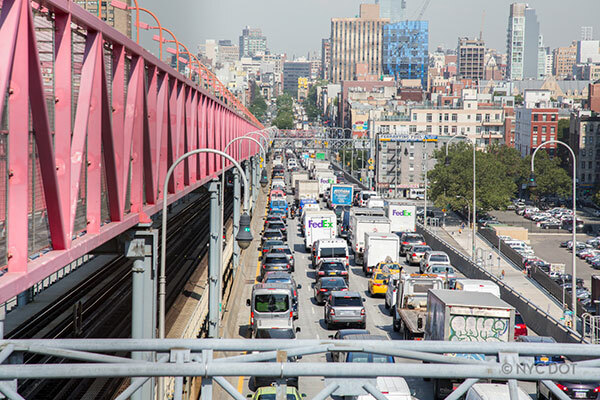 The New York City Department of Transportation is developing a plan to improve the quality of life for all New Yorkers through the safe, reliable, and environmentally responsible movement of goods. The citywide Smart Truck Management Plan will improve our understanding of truck route usage and compliance, movement of goods, needs of shoppers and receivers, and community concerns. With input from the community, the Department will then implement a series of strategies and actions to improve operations and enhance the economic vitality and quality of life for all New Yorkers. 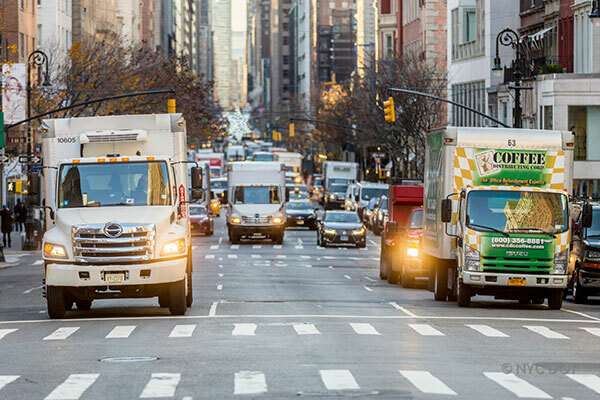 Delivery trucks and commercial vehicles are critical to the economic vitality of New York City (NYC), a population of 8.5 million. Without efficient freight transportation, retail stores would not have goods to sell and restaurants would have nothing to serve. As NYC’s population continues to grow, the demand for freight transportation will also increase, resulting in more trucks on the road. The continuous growth and demand on our transportation system has caused increased congestion, which reduces economic productivity and diminishes quality of life. To address these issues, NYC DOT is expanding its Off-Hour Deliveries (OHD) program. The OHD program encourage goods delivery off-hours between 7 pm and 6 am. Visit the program webpage to learn more. DOT developed the Truck’s Eye View (TEV) program in 2011 to provide education to the public on the blind spots around large trucks. The Truck’s Eye View program demonstrates to the public where the blind spots around large trucks are located. At events citywide, participants can sit in the driver’s seat of a truck and learn about the vehicle’s blind spots from a professional truck driver, to increase safety awareness for all roadway users. In 2017, DOT held five events with a total of 1,742 participants. With the hopes of reaching more residents citywide, the NYCDOT will be presenting the TEV program in all five boroughs in 2018. With the help of our trucking association affiliates and inter-agency volunteers, we will be looking to bring a truck to a neighborhood near you. We’re asking everyone to come experience sitting in a truck and learn about truck blind spots and how to be safer on city streets! 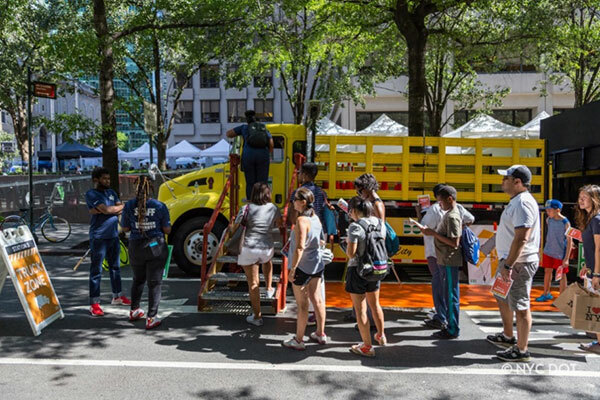 To learn more about the Truck’s Eye View Program or request a display at a community event in your area, please contact us at FreightMobility@dot.nyc.gov. 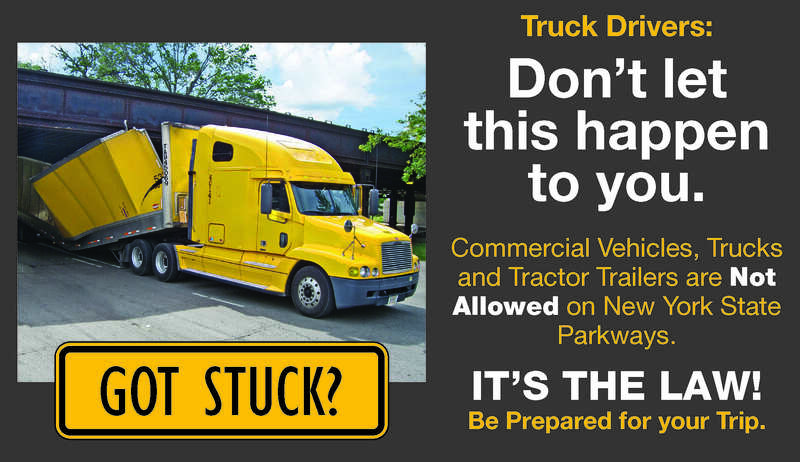 DOT’s Check It or Wreck It campaign encourages truckers to view the truck route map, use a truck-specific GPS and avoid parkways in the New York Metro Area. New York City has unique definitions for commercial vehicles and trucks that differ from New York State Department of Motor Vehicles classifications. Find out how your vehicle is classified so you know what rules and regulations apply to you. DOT publishes a full color, double-sided map featuring the City's comprehensive Truck Route network overlaid on top of the entire arterial street network, making it easier for drivers to locate specific streets and intersections. The map also contains helpful information on truck route signage, weight limits and dimensions, overweight/overdimensional permitting and truck related violations as well as City, regional and state truck-related resources. This map is to be used for reference purposes only. Please refer to the New York City Traffic Rules for the most current traffic regulations governing truck routes as well as permissible truck weight and dimensions. Information on this map is subject to change without notices. Always observe all posted restrictions as limitations may apply to designated truck routes. See a mistake? Please help us make the next edition of this map more accurate. Inform the New York City Department of Transportation about any inaccuracies or omissions you may notice by emailing truckroute@dot.nyc.gov. 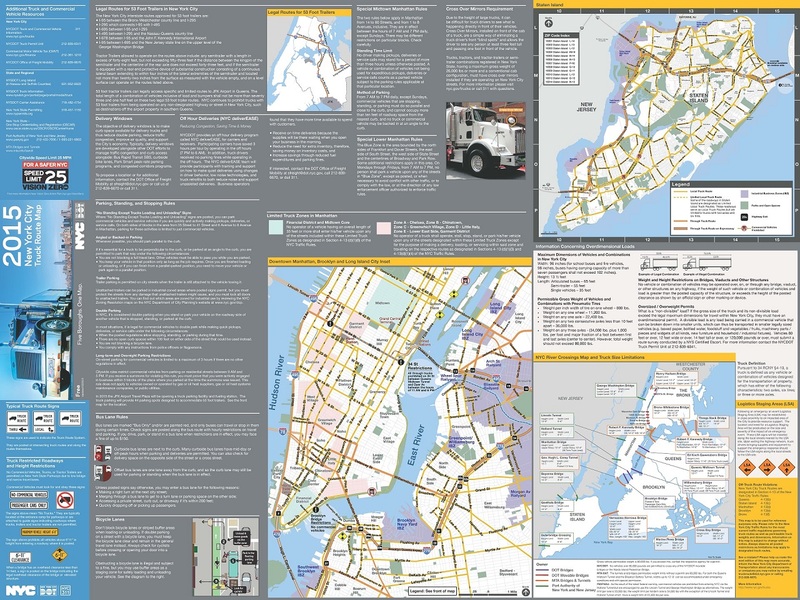 Fill out this form below to request a free New York City Truck Route Map. Please provide accurate and complete mailing information, including a company name if maps are to be mailed to your business or organization. Changes made to the Truck Route network and map between 2012 and 2015 are summarized below. For details of changes, see links below. Download details on the truck route changes in Brooklyn (pdf) Download details on the truck route changes in Queens (pdf) 53 Foot Tractor Trailers can access specific and limited routes to JFK Airport in Queens. See the reverse side of the 2015 Truck Route Map for more information. The New York City Traffic Rules and Regulations are contained in Chapter 4 of Title 34 of the Rules of the City of New York. It includes rules on traffic signals; pedestrians; restrictions on turns; speed restrictions; other restrictions on movement; rules for parking, stopping, and standing; rules for buses, taxis and for-hire vehicles; truck routes; rules pertaining to parkways and parks; limitations on dimensions and weight of vehicles; and other information. The New York City Traffic Rules require that commercial vehicles display the registrant's name and address on both sides of the vehicle. This is described in Section 4.08 of the Traffic Rules. The Federal Motor Carrier Safety Administration (FMCSA) issues vehicle identification numbers, known as USDOT numbers, to commercial vehicles that operate interstate to transport passengers, or haul cargo. New York State requires intrastate commercial motor vehicle registrants to obtain a USDOT number. For more information, contact the FMCSA at 800-832-5660 or visit https://www.fmcsa.dot.gov/registration/do-i-need-usdot-number. Highway Use Tax (HUT) numbers are administered by the New York State Department of Tax and Finance. For information call 1-800-980-5437 or (in New York State) 518-388-5245, or visit OSCAR. Local Law 77, which was signed into law in 2003, requires the use of ultra-low sulfur diesel and "best available technology" for reducing emissions from non-road equipment used on City construction projects. See the Verified Technologies List of all the diesel retrofit technologies that the US Environmental Protection Agency has approved for use in engine retrofit programs. See the summary of verified diesel emission control strategies by the California Air Resources Board. The allowed gross vehicle weight in New York City is 80,000 pounds. Read the full weight and size limits Vehicles that exceed New York City's size and weight limits must obtain overdimensional permits. What you need to know about parking your truck or commercial vehicle in New York City. Because of the height of large trucks, it can be difficult for truck drivers to see what is happening directly in front of their vehicles. This has contributed to a significant number of pedestrian deaths in New York City. operate in New York City (except for expressways). 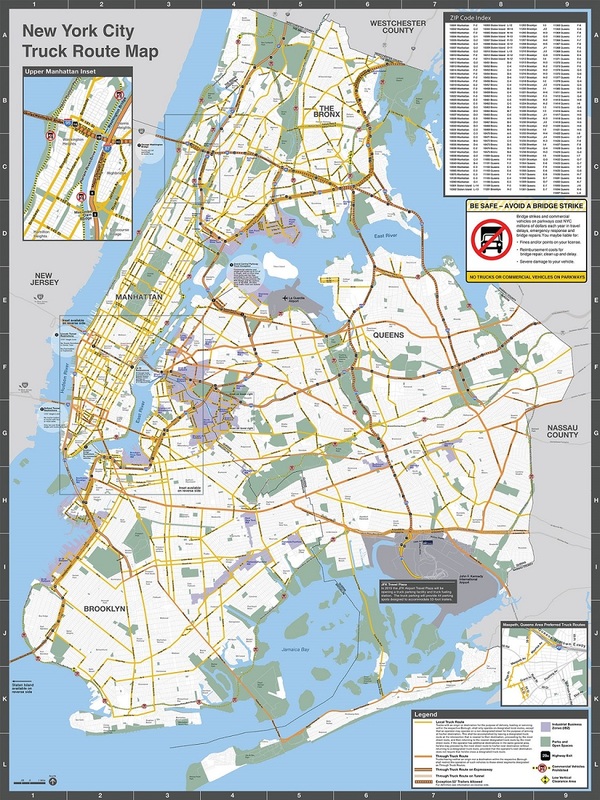 DOT issues Express Lane Permits that enable ambulettes, commuter vans and shuttles and other mass transit fleets to use the high occupancy vehicle (HOV) lanes leading to the Queens-Midtown and Brooklyn-Battery Tunnels.